I got this '99 Miata, (a.k.a. MX-5) and she is my favourite pet. I've had Bonnie for just over a year and 20K miles now. She's my very first car, me being a Euro immigrant and all. So from my last visit to Europe I brought back a 5-quart canister of some super-duper synthetic 5-40 motor oil I got there as a present. I could not wait to put it in my car. It says on the canister (in German) that the oil should be good for about 30K miles or 2 years, whatever comes first. When it was time for the oil change, Harry, the mechanic of my unconditional trust says that he does not really care what the Germans have written on the package, and that I will gunk up my engine if I follow these instructions. So after much bickering, we agree that he will let me keep the oil in there for 7K mi, and we'll change the oil filter at 3,5K. Time flies, and so here I was, getting my oil filter changed. My car's on the lift, and I see a nasty tread wear pattern on the inside of the right rear tire. I had that tire blow out on me last October, and so I assume that the wheel must have gotten out of alignment then, and that the nice people at the Sears auto center I got towed to from Nowhere, VA must have forgotten to align this wheel, even though I asked them to. So I ask Harry if he knows someone I can go to for alignment and stuff, and he recommends a place close to where I live, which I call that same afternoon and make an appointment. I have to note here, that a bit before I had the tire blowout, I also smashed up two of the Helium alloy rims that came with the car, and was using some semi-light Konig Reasons while I saved up enough money to buy and replace the Heliums. About six weeks ago, I got two new Heliums, and so I wanted to get them installed now as well. I got there, new rims in the box in the passenger seat, and went in. The owner was just wrapping up with an earlier customer, so I stood and looked around idly. On the literature rack, I notice a sticker of the Tarheels Sports Car Club--the one I went to autocross with. So as soon as he turns to me, I ask him if he's in the club. Turns out he is! We start talking. He tells me he's not been to an autocross for a while now, because he is into track events now. Me as a novice, I'm just standing there in awe. After a while, we also get to the car and what needs to be done on it. He says that to get all this done, I'd need to leave the car with him for a few hours. All would be well, but I am on a lunch break, 5 miles from the office, and my only means of transportation will be on the lift in a few minutes. I am trying to figure out who to call at the office to pick me up, when he says that if I, a Miata freak, would not mind driving a Beemer, I could take his, just get back here by six. Wow. That was nice. Really nice. 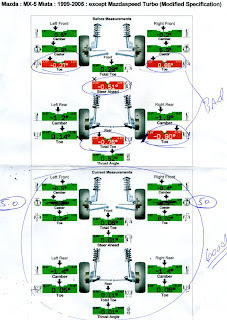 When I got back, six on the dot, the car had four same-looking wheels which now also were properly aligned, for street with a nod to autocross. Can't wait to try out this setup now.